NOVEMBER 4, 1967 : TAMPA STADIUM DEDICATED – Tennessee defeats the University of Tampa, 38-0 in the first contest played in the facility. The 46,700-seat stadium costs $4.1 million to build. AUGUST 10, 1968 : FIRST GAME IN TAMPA STADIUM – Washington defeats Atlanta 16-14 in a pre-season match before a crowd of 42,000 in first NFL action at new stadium. APRIL 21, 1975 : STADIUM LEASE APPROVED – The Tampa Sports Authority unanimously approves a 30-year lease agreement with the Buccaneers for use of Tampa Stadium. Three days later, the Tampa City Council votes 6-1 to approve the lease and expansion to 72,000 seats. JULY 9, 1975 : STADIUM EXPANSION BEGINS – Ground is broken for the expansion of Tampa Stadium, financed by the sale of $13 million in bonds by the Tampa Sports Authority. Tampa Stadium (nicknamed The Big Sombrero and briefly known as Houlihan's Stadium) was a large open-air stadium (maximum capacity about 74,000) located in Tampa, Florida. It opened in 1967, was significantly expanded in 1974–75, and was demolished in 1999. The facility is most closely associated with the Tampa Bay Buccaneers of the National Football League, who played there from their establishment in 1976 until 1997. It also hosted two Super Bowls, in 1984 and 1991. Besides the Buccaneerss, Tampa Stadium was home to the Tampa Bay Rowdies of the original North American Soccer League, the Tampa Bay Bandits of the United States Football League, the Tampa Bay Mutiny of Major League Soccer, and the college football programs of the University of Tampa and the University of South Florida. It also hosted many large concerts, and for a time, it held the record for the largest audience to ever see a single artist when a crowd of almost 57,000 witnessed a Led Zeppelin show in the facility in 1973. The land on which Tampa Stadium was situated had been the perimeter of Drew Field, a World War II-era airfield which was the precursor to Tampa International Airport. In 1949, the city of Tampa bought a 720-acre grassy parcel between the airport and West Tampa from the federal government with the idea of eventually building a community sports complex. Al Lopez Field was the first phase of the project, opening in 1955. By the early 1960s, Tampa's civic leaders were interested in attracting a National Football League team to the area. Several well-attended NFL exhibition games were held at Phillips Field near downtown, but the venue was too small to support a professional football franchise. So with the encouragement of NFL officials, the city decided to build a larger facility which could be used by the University of Tampa's football team in the short term and could be expanded for use by a theoretical pro team in the future. 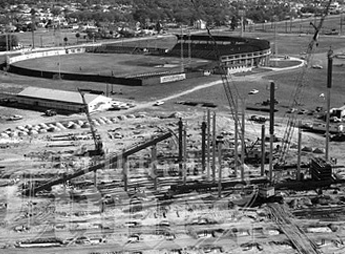 Construction of Tampa Stadium began in the fall of 1966 directly adjacent to Al Lopez Field, which was by then the home of the Tampa Tarpons of the Florida State League and the spring training home of the Cincinnati Reds. Even though it contained separate football and baseball venues plus the Reds' training grounds, the lot purchased in 1949 was still large enough to allow for ample parking in the open land surrounding both facilities. When it opened in 1967, Tampa Stadium consisted of a matching pair of large arch-shaped concrete grandstands with open endzones. The seating consisted of long, backless aluminum benches that were accessed via short tunnels (vomitoriums) which connected the seating area to wide, open concourses at the rear of the grandstands. The benches were arranged in two large tiers divided by a horizontal walkway about halfway up the grandstands. The slope of the grandstands was relatively steep, giving every seat a direct and unobstructed view of the field. The official capacity was 46,481, though temporary bleachers could be placed in one or both endzones if needed. Over the lifetime of Tampa Stadium, the natural grass turf consisted of several varieties of Bermuda grass, most notably Tifway 419. The playing surface was consistently one of the best in the NFL, and was regularly named a players' favorite in surveys conducted by the National Football League Players Association. 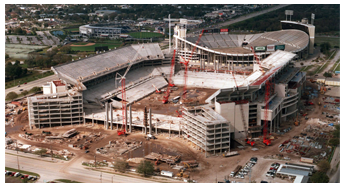 Tampa Stadium was built almost exclusively of concrete. Throughout its existence, exterior walls were painted light tan or white or left as bare concrete, as were the flooring surfaces. Seating consisted of long aluminum benches, and there was no roof or overhang of any kind over the field or seating areas. While the stadium's minimalist design allowed for very good sight lines, it also exposed both spectators and players to the full brunt of Tampa's subtropical climate. This was especially true after the stadium was fully enclosed for the Bucs' 1976 inaugural season, cutting off breezes which had flowed through the open endzones. While fans could retreat under the grandstands to the shade of the wide concourses where concessions and restrooms were located, players and personnel on the field had no such recourse. Cooling equipment was usually placed near the sideline benches. The Buccaneers were also allowed to wear their white jerseys at home, forcing their opponents to suffer in their darker (and hotter) jerseys. During the summer and early autumn, events in the stadium were often scheduled in the evening hours to avoid the often oppressive afternoon heat and humidity. In another nod to local weather, the natural grass playing surface was highly crowned to provide rapid drainage during Tampa's intense thunderstorms, with the sidelines almost 18 inches lower than the center of the field. 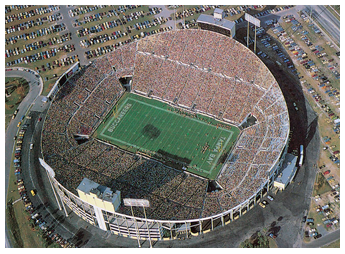 Tampa Stadium underwent an extensive expansion project in 1974–1975 after the city was awarded an NFL expansion team. Over 27,000 seats were added by completely enclosing the open end zones, making the venue one of the largest in the NFL with a capacity of 71,908. The resulting arena was not in the shape of a simple bowl. It was highest at the center of the two sideline grandstands and gently sloped downward to a rounded corner where it met the new sections, which were about half as tall. Much later, the stadium was dubbed "The Big Sombrero" by ESPN's Chris Berman for the unique undulating hat / wave shape created along the top of the stadium by the 1975 additions. The last major renovation took place in the early 1980s when, in preparation for its first Super Bowl in January 1984, the press box atop the west grandstand was updated and a large suite of luxury boxes was added atop the east grandstand. This configuration gave the facility its maximum seating capacity of 74,301. For the 1990 season, large flagpoles were mounted on the upper rim of the stadium as part of a stadium update that included the addition of a JumboTron screen in the south end zone and smaller scoreboards above the field-level tunnels in two corners of the stadium. The poles were used to fly large flags for each of the NFL's teams until 1997, when the Buccaneers adopted a uniform redesign featuring a red flag on their helmets. Large versions of the flag were hoisted on the stadium's flagpoles when the Buccaneers penetrated their opponents' 20-yard line. The franchise continued this practice when it moved to Raymond James Stadium next door a year later. Tampa Stadium was completed just in time to host its first sporting event – a football game between the University of Tampa Spartans and the #3 ranked University of Tennessee Volunteers on November 4, 1967. While the Spartans lost that game 38-0, they would enjoy later success in their new home, moving up to Division I football in 1971 and sending several players to the NFL, including Freddie Solomon and John Matuszak. However, university officials were unsure of continued community support after Tampa was awarded an NFL expansion franchise. "Tampa U" president B. D. Owens ended the football program after the 1974 season, saying that the school would face bankruptcy if it had to subsidize the sport. The Rowdies played their home games in Tampa Stadium every summer until the original North American Soccer League disbanded in 1984. Subsequently, the Rowdies continued on, first as an independent team, then in other leagues (ASL, APSL) and used the stadium every year through 1990. In 1991 and 1992 they moved across town to the smaller USF Soccer Stadium, before returning to Tampa Stadium in 1993 for their final season of play in the APSL. Looking to showcase the city's new facility for the NFL, community leaders arranged for several exhibition games in Tampa Stadium in the late 1960s and early 1970s. The first such game featured the Atlanta Falcons and Washington Redskins in August 1968 and drew a near-sellout crowd. Eleven more games were held in the following seasons with similarly enthusiastic crowds, including three featuring the Baltimore Colts in 1972, when the team trained in Tampa during the NFL preseason. These preseason games gave NFL owners and officials ample opportunity to assess the Tampa Bay area and the stadium, and on April 24, 1974, Tampa was awarded an NFL expansion team to begin play in the 1976 season. The Buccaneers' first regular season home game was held on September 19, 1976, when the Bucs lost to the San Diego Chargers 23-0. That would become a trend, as the team began their existence with an NFL-record 26-game losing streak. They would not win a game on their home field until defeating the St. Louis Cardinals on the last game of the following season, December 18, 1977. Jubilant fans swarmed the Tampa Stadium turf and tore down the goal posts. The Buccaneers had improved enough by the 1979 season to host the NFC Championship Game, which they lost 9-0 to the Los Angeles Rams. The Bucs played 18 additional seasons in the facility but struggled through most of them. They would only host one more playoff game on their original home turf: an NFC Wild Card Game vs. the Detroit Lions on December 28, 1997, which they won 20-10. This would be the last game the team ever played in Tampa Stadium, as they moved next door to Raymond James Stadium in 1998. In 1991, the organization initiated the "Krewe of Honor", which featured a mural of the first class of three members. Quarterback Doug Williams was inducted September 6, 1992 and owner Hugh Culverhouse on September 5, 1993. No additional members were added before Tampa Stadium was closed and demolished. Malcolm Glazer also acquired naming rights to Tampa Stadium when he purchased the Buccaneers in 1995. In October of that year, he had the Houlihan's restaurant chain, another business in his portfolio, pay the Bucs $10 million for those rights. This resulted in the official name of the facility being changed to "Houlihan's Stadium" in 1996 and in Glazer being sued by Houlihan's stockholders, who were not happy about purchasing stadium naming rights in an area in which the chain had no restaurants. 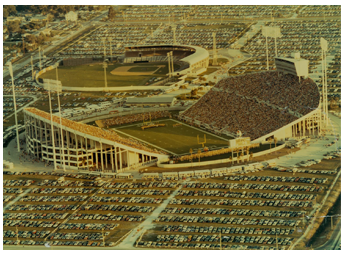 Tampa Stadium was the home field for several additional teams and hosted a wide variety of events during its lifetime. From 1983 to 1985, one of the twelve original USFL franchises, were the stadium's third professional tenant. The Bandits enjoyed strong ticket sales and fan support and were one of only two USFL teams (the Birmingham Stallions being the other) to stay in their original city and stadium and have the same head coach (former Florida Gators and Bucs quarterback Steve Spurrier) for the league's three seasons. The Bandits folded along with the USFL after the 1985 season. The team played its initial season at the stadium in 1997, becoming the stadium's second and final collegiate tenant. The Bulls would play the final football game at the stadium on September 12, 1998, defeating Valparaiso 51-0 before moving to Raymond James Stadium for their next home game on October 3, 1998. Major League Soccer placed one of its original teams in Tampa in 1996. The Tampa Bay Mutiny were the stadium's fourth and final professional tenant. The Mutiny used the stadium as their home field for their first three seasons, and moved to Raymond James Stadium in 1999. 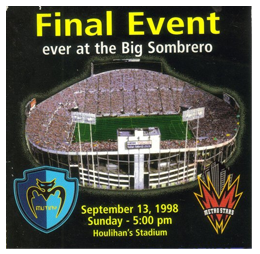 They hosted the last sporting event at the stadium on September 13, 1998, when they defeated the New York MetroStars 2-1 in front of 27,957 people. Tampa Stadium hosted two Super Bowls. Super Bowl XVIII in which the Los Angeles Raiders defeated the Washington Redskins, took place on January 22, 1984. Super Bowl XXV, in which the New York Giants beat the Buffalo Bills 20-19 in what was the closest Super Bowl game ever, took place on January 27, 1991. Tampa Stadium is one of five stadiums that had hosted a Super Bowl that are no longer standing (the other four are the Tulane Stadium, demolished in 1980, Stanford Stadium, in 2006, the Orange Bowl, in 2008, and the Metrodome, in 2014); subsequent Super Bowls in Tampa have been played at Raymond James Stadium. The NFL Pro Bowl was held at Tampa Stadium on January 29, 1978, two years before the game began a 30-year residency in Honolulu, Hawaii. Though the University of Florida is approximately 120 miles north in Gainesville, a strong local alumni base persuaded the Florida Gators football team to play nine regular season games in Tampa Stadium between 1968 and 1989. The Gators have not played a regular season contest in Tampa since a 1990 expansion made Florida Field the largest football facility in the state. However, they have played in three Outback Bowl games in Raymond James Stadium. In 1978 and 1979, the stadium hosted the Can-Am Bowl, which was a college all-star game pitting seniors from the United States against seniors from Canada. The contest used the rules of Canadian football, which required that the playing field be extended wider and longer than usual. From 1978 to 1996, Tampa Stadium hosted the Florida Classic rivalry game between the Bethune-Cookman University Wildcats and the Florida A&M Rattlers, two in-state historically black colleges that play in the NCAA's Football Championship Subdivision. On July 15, 1984, Tampa Stadium hosted the 2nd USFL Championship Game between the Philadelphia Stars and the Arizona Wranglers. 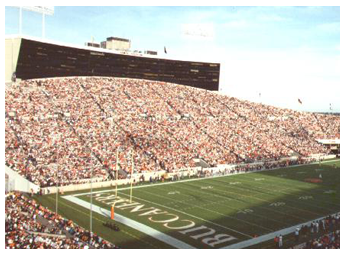 From 1986 to 1998, college football's Outback Bowl (previously held in Birmingham, Alabama as the Hall of Fame Bowl) was played in Tampa Stadium on New Year's Day. 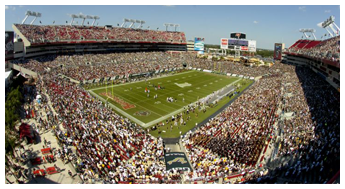 The 1999 Outback Bowl and all subsequent editions have been played at Raymond James Stadium. Tampa Stadium hosted a large annual USHRA monster truck rally in late January or early February (after football season, when turf damage wouldn't matter) for many years. Raymond James Stadium is the event's current site. Beginning in 1971, Tampa Stadium served as host for the American Invitational show jumping competition each spring, which brought together the USEF's top 30 ranked equestrians to compete for the sport's largest purse. The event is now held in Raymond James Stadium. Upon buying the Buccaneers in 1995, new owner Malcolm Glazer declared that Tampa Stadium was inadequate and threatened to move the franchise to another city unless a new stadium was built at taxpayers' expense. To accommodate these demands, Hillsborough County raised local sales taxes and built Raymond James Stadium just south of Tampa Stadium in 1997–98. 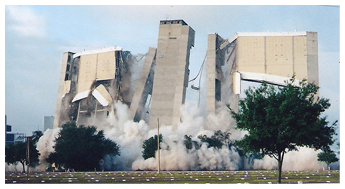 Demolition of Tampa Stadium proceeded soon after the Tampa Bay Mutiny's final home game on September 13, 1998. Wrecking balls and long reach excavators were used for much of the process. The last portion of the stadium (the east side luxury boxes built for the stadium's first Super Bowl), was imploded on April 11, 1999. The land was then cleared and converted into a parking lot. Part of that demolition was featured in a 1999 Modern Marvels episode entitled "Demolition". Raymond James Stadium: also known as the "Ray Jay", and is home to the Tampa Bay Buccaneers of the National Football League (NFL) as well as the NCAA's South Florida Bulls football team. The stadium seats 65,890, and is expandable to 75,000 for special events. The stadium also hosts the annual Outback Bowl on New Year's Day and the Monster Jam tour for monster trucks holds an event at the stadium. Raymond James Stadium hosted Super Bowls XXXV and XLIII, as well as the 2017 College Football Playoff National Championship. Raymond James Stadium was built to replace Houlihan's Stadium at the demand of the new Bucs owner Malcolm Glazer. It is located adjacent to the site of the old stadium on the former location of Al Lopez Field, a minor-league baseball stadium that had been demolished in 1989. Once completed, the final cost of the new stadium was $168.5 million, with the entire cost publicly financed. The stadium officially opened on September 21, 1998, when the Tampa Bay Buccaneers defeated the Chicago Bears, 27–15. The stadium hosted its first soccer game on March 20, 1999, when the Tampa Bay Mutiny lost to D.C. United, 5–2. 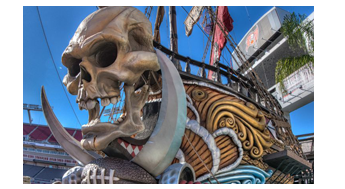 One of the most recognizable features of the stadium is a 103-foot (31 m), 43-ton steel-and-concrete replica pirate ship, which fires replica cannons each time the Bucs score points or enter the other team's red zone. The cannon fires once for each point scored. In addition, when the Buccaneers enter their opponent's red zone, stadium hosts hoist team flags around the perimeter of the upper deck. During various times throughout the game, the song "Yo Ho (A Pirate's Life for Me)" is played on the stadium public address system (taken from Pirates of the Caribbean), which signals patrons on board the ship to throw beads, t–shirts, and other free prizes to the people below. The segment is also known as a "Mini Gasparilla" to most fans. An animated parrot sits on the stern of the pirate ship. Controlled by radio and remote control, the parrot picks fans out of the crowd and talks to those passing by. 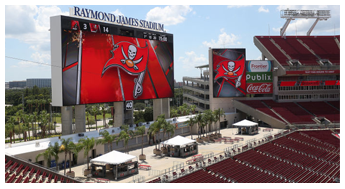 The two "Buc Vision" 2,200-square-foot (200 m2) Daktronics video displays were among the largest in the league when they were built and in 2016 they were replaced with a 9,600-square foot, high-definition video board in both end zones. 'Buccaneer Cove' features a weathered, two–story fishing village facade, housing stadium concessions and restrooms. All areas of the stadium are ADA compliant. Temporary bleachers were erected in the end zones for Super Bowl XXXV, which set a record stadium attendance of 71,921. The stadium attendance record has since been surpassed by the 2017 College Football Playoff National Championship, which also made use of temporary seating. The stadium is referred to as "Ray Jay" or "The New Sombrero", a spinoff from "The Big Sombrero", the nickname of Houlihan's Stadium. Somewhat derisively, it has been occasionally referred to as "the CITS", a name coined by long-time local sportscaster Chris Thomas which stands for "Community Investment Tax Stadium", referring to the fact that the stadium was entirely financed by local taxpayers. Immediately upon purchasing the Bucs in 1995, new owner Malcolm Glazer declared Houlihan's Stadium inadequate and began lobbying local government for a replacement. When the community did not move quickly enough to suit the Glazer family, the new owners openly contacted several other cities around the U.S. about possible relocation. On September 3, 1996, the voters of Hillsborough County, Florida approved, by 53% to 47% margin, a 30-year, half–cent sales tax to build new schools, improve public safety and infrastructure, and to build the Buccaneers a $192 million new stadium entirely with public money. The team signed a stadium lease in which the local government must pay for almost all of the stadium expenses while the franchise keeps almost all of the proceeds. Former Tampa mayor Bill Poe sued to stop the deal, claiming that giving such a "sweetheart deal" to a private business violated Florida's state constitution. A local court agreed with Poe, but the Bucs and local government appealed. Eventually, the Supreme Court of Florida ruled that the agreement was constitutional, and construction continued as planned.